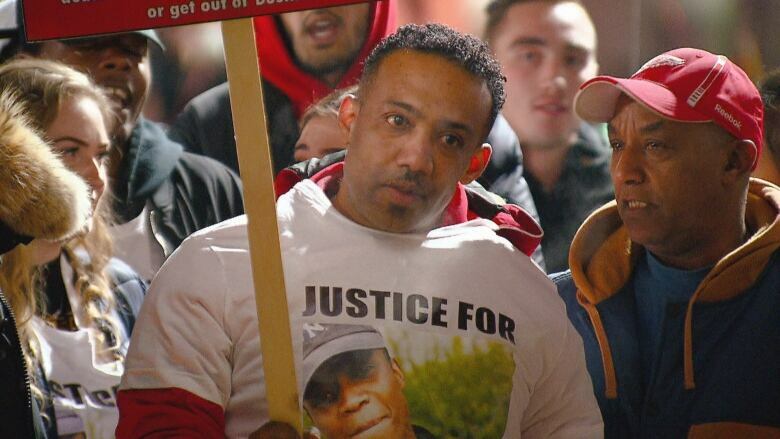 More than one hundred people gathered outside The Ranch Roadhouse on Friday night calling for justice for Mohamed Abdi, who died after being kicked out of the bar on a cold night this month. Abdi, 20, was kicked out of the south Edmonton bar on Nov. 16 because bouncers thought he was too intoxicated, friends say. His body was found two days later under a truck at a nearby car dealership. It was -16 C the night he left the bar. His family believe he froze to death. A school bus full of demonstrators arrived in the parking lot Friday at around 7 p.m., two hours before the bar was set to open. Bundled up for a chilly night, they held signs calling for the bar to shut down. "We need justice for my nephew," said Abdifatah Abdulkadir, Abdi's uncle and one of dozens of people wearing shirts with his nephew's face printed on the front. Abdulkadir said he was "thrilled" by the support. As of Friday night, more than 25,000 people had signed a petition calling on the Ranch to seek training, hire new and qualified staff or shut down completely in the wake of Abdi's death. A GoFundMe page to support Abdi's family has raised more than $10,000 in four days. "Next year, we don't want to see another young man die on the streets," Abdulkadir said. A spokesman for the Ranch said employees took steps to ensure Abdi's safety and noted that he left the establishment with a friend. In a statement, The Ranch apologized and said the bar has launched an internal investigation. 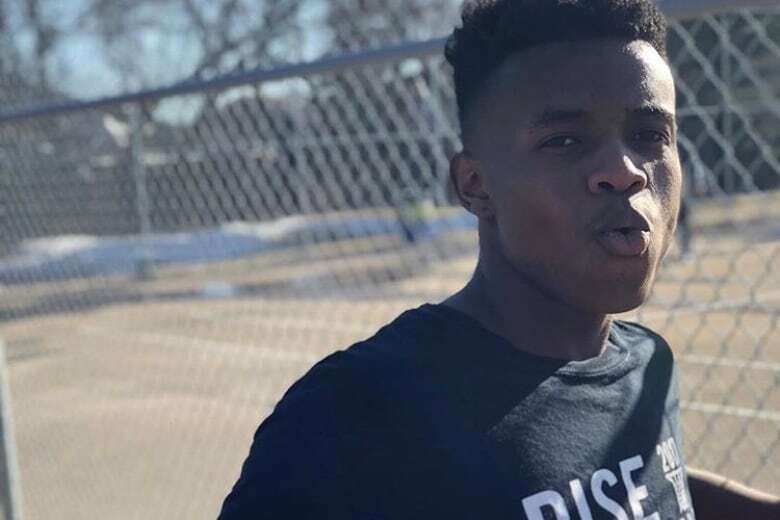 The Edmonton Police Service deemed Abdi's death non-criminal and is not investigating. Alberta Gaming, Liquor and Cannabis is investigating. Last November, AGLC also investigated the hypothermia death of Tyler Emes, 18, who left the same bar after a night of drinking. No sanctions were issued. Abdifatah Abdulkadir said his nephew was the oldest of eight siblings and a role model for his cousins. Abdi's mother was away on vacation in Kenya when her son was found dead. Abdi had initially left on that trip with her, but cut it short so he could return home to train for a fitness test with the goal of joining the military, Abdulkadir said. His mother did not speak with CBC News at Friday's demonstration and spent most of the evening in a car, overcome with emotion. "She cannot even stand. We brought her here to see how many people are supporting her son," Abdulkadir said. The oldest of eight siblings, Abdi arrived in Canada from the Kakuma refugee camp in Kenya when he was six. "He was a role model for the family and now he's gone," his uncle said. Agar Agar grew up with Abdi, or "Mo" as he was known to friends. He was with his longtime friend the night he went missing. 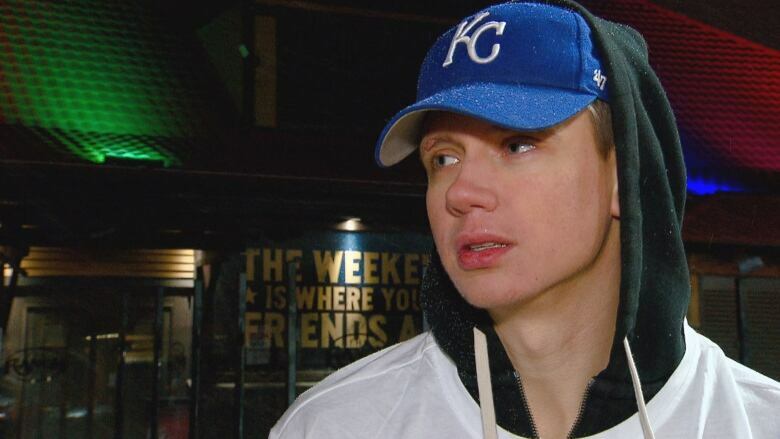 Agar said he himself was drunk and in no state to take care of Abdi, and can only remember pieces of the evening. They lost track of Abdi after going to a gas station across the street, one of the few places of refuge nearby in an area dotted with plazas and auto repair shops. "You're not supposed to make drunk people babysit other drunk people," he said. "At least get them home and get them safe." Jordan Gizowski's forearm was covered in a bandage as he stood alongside Abdi's friends on Friday night. Underneath, a banner wraps around a cross bearing Abdi's initials, his birth date and the date he was found dead. "He's my best friend. He was the closest guy that I had and now he's gone. So I had to get a memory of him," Gizowski said. Gizowski said he was also at the bar the night of the incident and stayed up for hours searching for his friend. "We drove past the place he was found five or six times. It just hits me harder because we could've found him," he said. Nathan Monteiro said he was amazed to see new faces at the demonstration. He said it bespoke his friend's charismatic and joyful personality. "I loved him to death and he deserves justice. He needs it. We all need it."